Welcome to a new week and a new month. After our run of four consecutive home games, October will see us play four of six fixtures away from the Emirates. It’s quite interesting how good our form at home is. If it’s not quite a fortress, the team have gotten into a good habit of winning games there, with just a couple of defeats in the last 12 months in the Premier League and that shock Europa League loss to Ostersunds FK. We all know our away record last season was pretty, pretty, pretty bad, and already things have improved a bit with wins on the road over Cardiff and Newcastle. This upcoming run of fixtures will give us a greater insight into this team. We go to Fulham at noon on Sunday after long trip to Azerbaijan in the Europa League on Thursday. And later in the month we’re off to Portugal, immediately followed by another London derby, this time a 13.30 kick off at Selhurst Park against Crystal Palace. It does appear as if this is a team with more resilience than last season’s, but we’re still very much in the early stages and it’s difficult to draw any definitive conclusions. How Unai Emery manages his squad through the upcoming challenges will tell us a little more about what he’s doing, and how he’s doing. Already, I think we can see that there are some players who are less involved than people might have thought. Mohamed Elneny wasn’t even in the squad for the Watford game, and there was no suggestion beforehand that he was injured, so unless he suffered a late niggle, he was simply left out altogether. The Egyptian international has yet to make an appearance in the Premier League so far this season, and it appears as if he’s definitely considered as part of Emery’s ‘second string’, if you like. Henrikh Mkhitaryan is another who, after starting the first three games and scoring against Chelsea, has fallen by the wayside a little. He was on the bench against Cardiff and Newcastle, and missed out against Everton due to injury. He played 90 minutes in the Carabao Cup, and when it was 0-0 with fifteen minutes to go against Watford on Saturday, it was Danny Welbeck who Emery used as his final sub. A good move as it turned out, as he was involved in the second goal. The fact we had to replace Petr Cech for Bernd Leno may have hampered the Armenian’s chances of getting on, but I’m curious to see how much he’s involved as the season progresses. Chances are he won’t be making the trip to face Qarabag due to the political goings-on there, so he’d be in contention for the game against Fulham on Sunday, but if there’s a place up for grabs in the front four – most likely at the expense of Aaron Ramsey whose contractual situation will result in diminished involvement – you’d have to say Welbeck and Alex Iwobi are ahead of him based on the way they’ve played this season. This is not to write him or Elneny off or anything, just an observation from what we’ve seen over the last few weeks. The season is long, and there’s a lot of football to play. I’m more positive and more confident with the ball. The boss has basically told me that if something doesn’t work, just keep going and don’t dwell on it. He’s told me to stop being so critical and to just keep trying no matter what happens, no matter if things don’t go as I want them to. That’s given me a lot more confidence to try a few more things, like beat a player, to shoot more. I’m always ready to get on the ball a bit more, so I guess it’s helped in that sense. He’s always felt to me like a player who would thrive with greater instruction. The freedom given to him under Arsene’s ‘go out and express yourself’ style worked from time to time,because he’s got natural talent and ability, but there’s no doubt after bursting his way onto the scene, he struggled to find consistency in his performances. Now, he’s got an exacting micro-manager, it suits him better, and we’re seeing that reflected in his performances. It’s pleasing because while criticism of his performances was understandable, it went too far at times. I realise that’s just the way of the world these days, a sad fact of online life, but to see a young lad who has come through our academy from an early age get that kind of stick wasn’t pleasant. Iwobi is as Arsenal as it gets, he’s been with us since he was a kid, and now he’s really pushing hard to become a regular first team player. Isn’t that exactly what people want from our academy? I hope he can keep it up. Another player who has come in for regular criticism is Hector Bellerin. 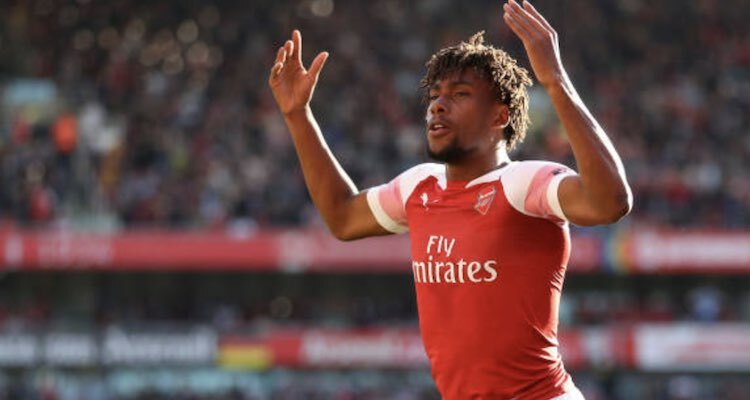 There’s no need to go into the nuts and bolts of that again, and like Iwobi some of it has been over the top, but he’s someone else who is slowly, quietly, steadily improving under Emery. There’s greater defensive awareness and discipline, while he still has to do a lot of work patrolling up and down that right hand side. Perhaps training and working with Stephan Lichtsteiner has played a part in that too, because the veteran appears very willing to impart his experience and wisdom, and by all accounts is a real pro on the training ground. So, while there are clearly lots of things we need to work on, as outlined in yesterday’s post for example, there are green shoots of positivity elsewhere, not to mention the fact we’ve just won seven games in a row which is obviously a very nice run to be on. Right, that’s just about that, but I’ll leave you with the Arsecast Extra recorded last night with James. We chat about the Watford game, the Aaron Ramsey situation and loads more – and it is the 250th episode of the podcast, so we’d just like to thank everyone for listening and subscribing down the years. We really do appreciate it. Enjoy the show.